As an official tour operator of the organisers, we can guarantee entry to one of the most prestigious sportives in Europe. Your chances in the ballot are 1 in 3 or 4 so guarantee your entry with Love Velo instead of taking a chance. The Pordoi, Sella, Valparola and Giau all sit at over 2200 metres. 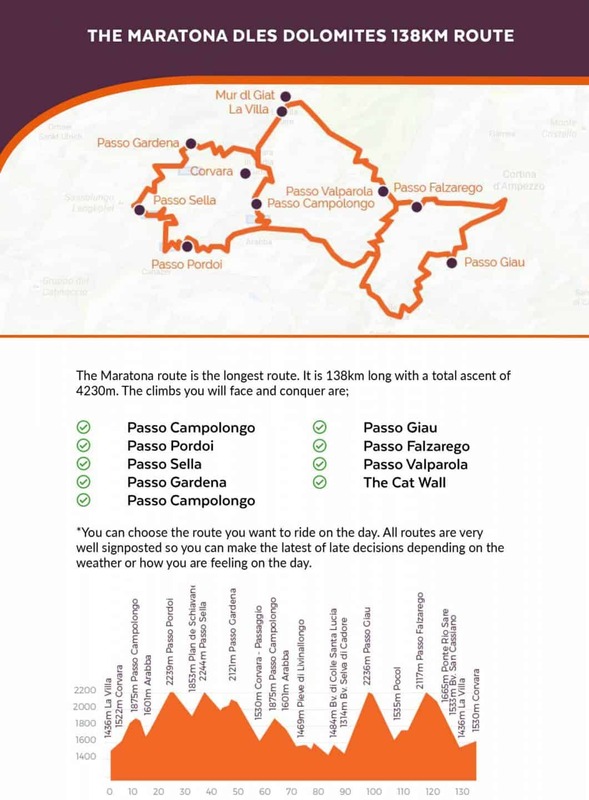 Climb the first three on the medium route or take them on as well as the legendary Giau on the long route. Incredible climbs await you on the 55km, 106km or 138km course. Touch down in Venice. We’ll be waiting to take you to your hotel if you book airport transfer with us. Check in, relax and make full use of the spa. Apperitivos are served tonight in the wine cellar, followed by dinner. Today you can spin your legs and check your bike is problem-free. You can also pick up your registration pack and race number from the organisers village. Guided rides are available for both hosted and non-hosted clients. We cycle on the Sella Ronda route: 52 km of the most awe-inspiring cycling you’ll ever experience. The ride takes place in the Campolongo, Pordoi, Sella and Gardena climbs. 52 km long with 1800 m of climbing, it will set you up nicely for the big event, with no gradient more treacherous than 7%. If you’d prefer to take it easy, we suggest simply riding the 30 km journey to registration and back. It’s the day before the race. You can join our guided ride if you’d like to test your legs, but we recommend resting up. If you do choose to cycle, the ride will start from Corvara, climb and then descend the Gardena from both sides. We’ll stop for a coffee at the top of the Gardena pass, so you can climb just one side and descend if you’d prefer. It’s an early start this morning. Breakfast is served from roughly 5.15 am, and you must be in your start pen by 6.15 am (15 minutes before the race begins). If you’re not in the pen 15 minutes before the start, the organisers will direct you to the back pen. Roads are closed to traffic, so the plan is to freewheel from the hotel to the race start. 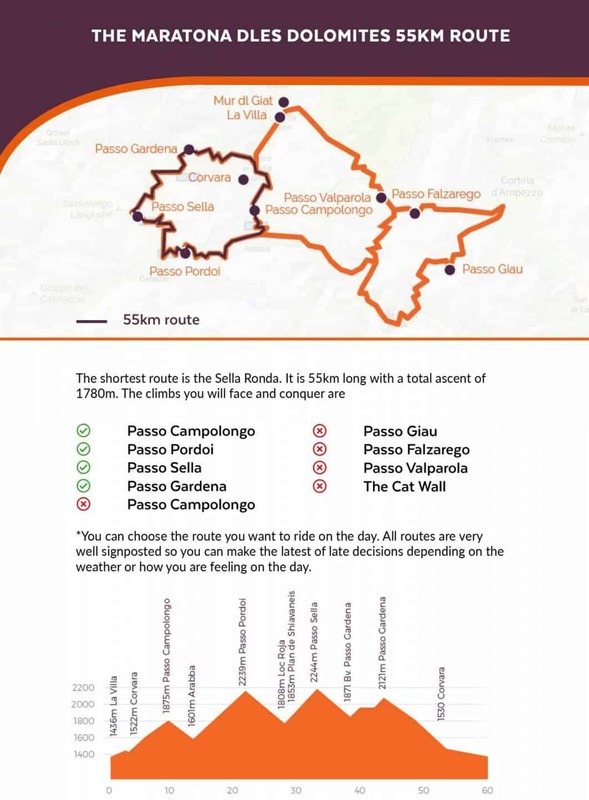 All riders make their way round the Sella Ronda, and you can choose your distance on the day. Unless you’re riding the short route, you’ll ride down through Arabba towards Andraz. 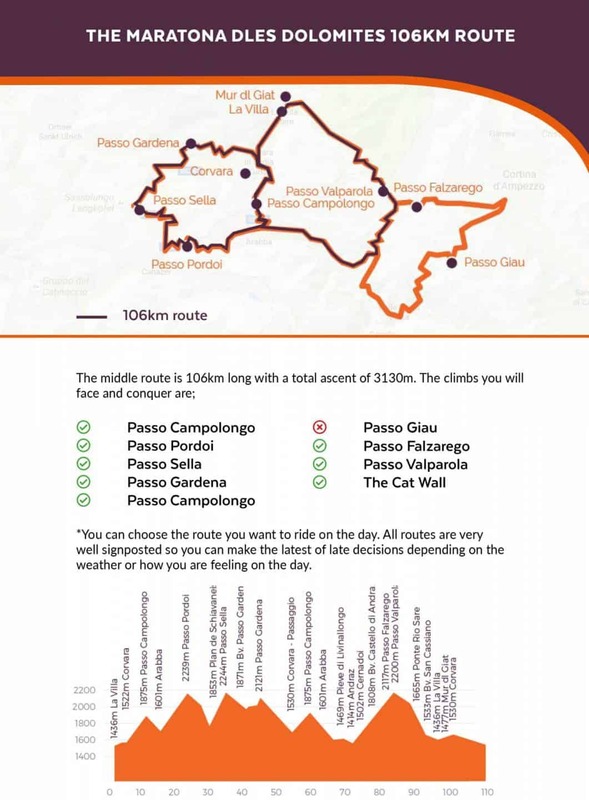 If you’d like the 106 km route, simply turn left at the clearly sign-posted intersection, or hop over the brow of the hill to continue down to the Passo Giau and the full 138 km distance. At the end of the race, we’ll be waiting for you in the Love Velo gazebo by the finish line. Enjoy a cold beer, take the weight off your legs and relax with us before grabbing a pizza at the Taverna or going back to the hotel for a shower. You did it! Check out and catch our transfer back to Venice. Just ask us for transfer times. The summer is usually warm and you're likely to experience good weather with high temperatures. However, the weather can be quite changeable in the mountains so please make sure that you come prepared with both warm and cold weather gear. The Dolomites are a UNESCO World Heritage Site, making them a unique and spectacular cycling backdrop. There are no flat landscapes in the Dolomites, you’re either pushing hard up the climbs or revelling in thrilling descents. 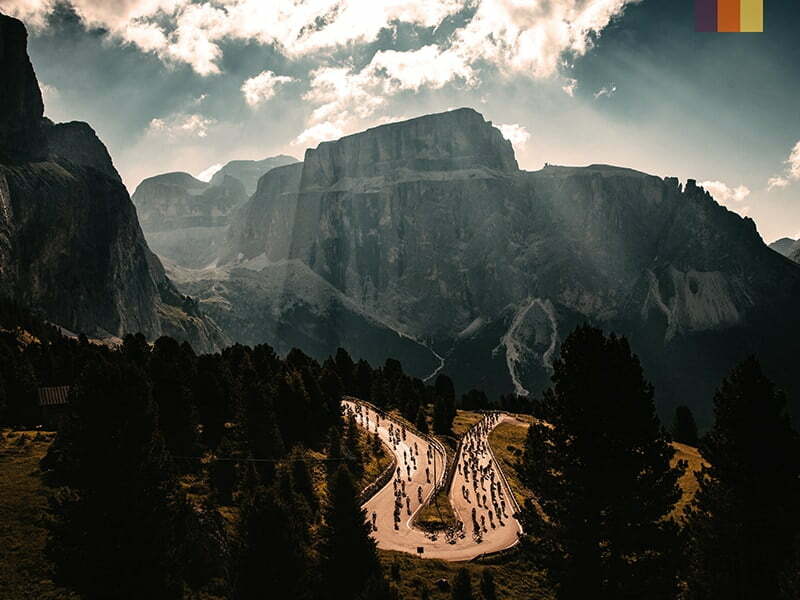 Entering its 33rd year, the Maratona dles Dolomites is unlike any other sportive in Europe. Starting pens are superbly organised and as soon as you start riding, you will see why this cycling event is so revered. Spectators line the towns as helicopters buzz overhead, capturing the elite race for Italian sports channels. Locals offer you cakes, pastries and coffees at the roadside as cow bells and Tyrolean whips echo throughout the valleys. The climbs themselves are magnificent. With most of them averaging relatively shallow gradients, you can really get into a rhythm. Other than the Passo Giau, no climb is too difficult. The descents are thrilling and the views over the rugged Dolomites offer some of the most panoramic views in Europe. Our favourite climb is the Falzarego, which showcases incredible views across the valley below. Fans of descending will enjoy the awesome 10 km freewheel from Arabba to Cernadoi. Choose from the 3* Miramonti Hotel in Corvara, or the 4* Sporthotel spa hotel in Corvara. Other separately-quoted options are available if you’d prefer to stay elsewhere in the valley. Stays at both the Miramonti Hotel and Sporthotel Panorama include dinner, bed and breakfast. You don't need to pick a route until you’re actually on the course. All riders complete the Sella Ronda, so if you’d like to do the short route, you’ll simply finish your ride after 55 km. If you can’t choose between the medium and long course, you have until the 70 km point to decide. There, you can turn left to climb the Valparola for the medium route, or carry on to the Passo Giau for the long route. This cycling event is superbly organised. The route is based entirely on closed roads until the (fairly generous) cut off points, where the roads reopen. Emergency assistance and occasional mechanical assistance are available on the ride. If you choose to join our group airport transfers, we will provide you with the flight details for which flights to book arriving into Venice Marco Polo. All transfers include the transfer of a bike box. All Love Velo trips include race entry in either pen 2 or 3. Guided riding takes place before the event and is open to clients on both hosted and non-hosted trips.